On sale! (normally $259) Level up your mobile gaming performance. 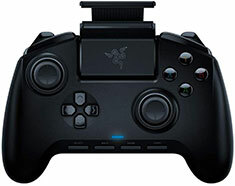 The Razer Raiju Mobile is a gaming controller that syncs with your mobile device and packed with full-fledged advanced features to give you the ultimate competitive edge. Wield the same power of our renowned flagship gaming controllers whether you’re at home or on the go.